"Everything you love about pumpkin pie but without the fuss of the crust, these custards are creamy and spiced just right." Heat oven to 350 degrees F. Whisk eggs in large bowl. Stir in pumpkin and pumpkin pie spice until blended. Whisk in sweetened condensed milk, milk, vanilla and salt until blended. Pour into 6 (6-ounce) custard cups. Place custard cups in a 13 x 9-inch baking dish. Place dish on oven rack in center of oven. Pour boiling water into pan around custard cups to a depth of 1 1/4 inches. Bake 35 minutes or until centers are almost set. Remove custard cups from baking dish and cool on wire rack. Serve warm or cold. 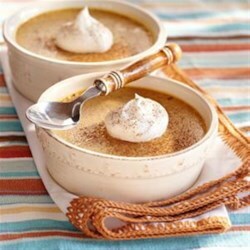 Top with whipped cream and sprinkle with cinnamon just before serving. I put in 3cups of acorn squash, and only added one can on sweet condensed milk. Made this custard for my family and dinner guests. Everyone loved it! This recipe is a keeper. The only thing I altered was the bake time; I baked for 50 minutes. This was an amazing substitute for pumpkin pie. A definite keeper. Very easy to make and delicious. I served this custard with a turkey dinner in February, and it made a perfect dessert without much effort. Very easy to make! I added some extra spice; nutmeg, ground clove, and allspice!! Very tasty!! !